I was always annoyed by the insincerity of the art world; I mean the way it pays lip service to stuff it says is important and then ingnores. 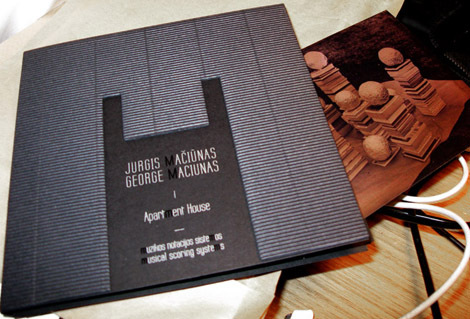 That’s what makes projects like the ensemble Apartment House’s new CD of music by George Maciunas so important. Every art history and not enough music histories discuss Fluxus, but the work itself has been neglected, disappeared from the cultural exchange. This silence prevents the art from considered as an artistic experience. A complacent assumption sinks in that these works are of interest only as an historical footnote, unworthy of further examination. Sadly, I missed a repeat performance of the Scratch Orchestra’s Nature Study Notes last weekend. The performance last summer was excellent. There’s another example of music being rediscovered after a generation in the wilderness. Last Tuesday I was at a concert given by the new music ensemble at City Univeristy, where they performed Paragraph 7 of Cornelius Cardew’s The Great Learning and an octophonic version of Takehisa Kosugi’s Micro 1. Both wonderful pieces, both set aside as artefacts of their time. So much of what has happened since the Sixties seems less like moving on and more of a retreat. Having been born a little too late, I grew up with the second-hand impression that so much had changed from the pre-1975 cultural scene not because it was old hat but because people couldn’t handle it. It’s been a long time waiting but these childhood impressions have increasingly been proven correct. Here is the fairly standard photograph of people performing George Maciunas’ In Memoriam to Adriano Olivetti. This is usually as far as anyone gets with Fluxus performance, a photo half as old as the grainy snapshots of the Cabaret Voltaire. What is this piece? Each performer devises a list of actions and assigns each action a number. They then must perform each action in a sequence determined by the numbers found on a discarded roll of paper from an adding machine. The means is historical; the method is still contemporary. On the Musical Scoring Systems CD, Apartment House play In Memoriam to Adriano Olivetti: the first by an ensemble making diverse sounds, the second by a string quartet. John Cage is always cited as a large influence on Fluxus, but Maciunas’ piece anticipates Cage’s last compositions by 30 years, pieces like Four 6 where performers are free to choose sounds but not when to make them. Other works by Maciunas such as Music for Everyman use similar methods, of sounds placed into subdivided grids of time, Musical Scoring Systems. The pieces in this album are all from the early 1960s, at a time when Cage was starting to explore the limits of chance and indeterminacy. It took Cage a couple more decades to achieve such a level of directness in his composition as shown on this CD. In the right hands Maciunas’ music is as open in its sound-world and transparent in its organisation as Cage’s. There’s an important distinction here, summarised by Cage’s friendly advice: “Permission granted, but not to do what you want.” Cage wanted his interpreters to exercise self-discipline and longed for self-imposed order. Maciunas, for all the irreverence brought into his musical scores (balloons, mouthfarts), is also bringing discipline and order into play. All those everyday actions, for all their apparent spontaneity in music or in life, are constrained into a strict, predetermined sequence of events. In Maciunas’s music the composer’s relationship with the performer, allowing the players to choose the order to be imposed upon themselves, is made more evident and gives away the lie behind the ideals Cage was extolling at the time. Solo for Rich Man is performed here, one of Satie’s oblique parables translated into actions. The paradoxes of the connections between money (or lack of it) and freedom (or lack of it) pile up in this simple score. Like all scores, its effect as an object itself is limited; it must be enacted. The Apartment House CD comes with no pictures of scores or descriptions of individual works, but it does come with an essay on Maciunas’ musical thinking. To be taken as seriously as any other music it is to be heard on its own merits. Solo for Rich Man is five minutes of ringing coins and crumpled paper in a montage of methodical transactions that are meaningless. Other than the Cagean connections, fifty years of exposure to New Music has allowed listeners to catch up with Fluxus. Deprived of theatrical spectacle, Solo for Violin (for Sylvano Bussotti) changes from a Dadaist stunt to a darkly comic caricature of a sonata by Helmut Lachenmann. The poor instrument’s protestations cannot help but recall the textures of the preceding Solo for Balloons (for Jean Pierre Wilhelm) – another palette of sounds which has since been fully claimed by avant-garde percussionists. 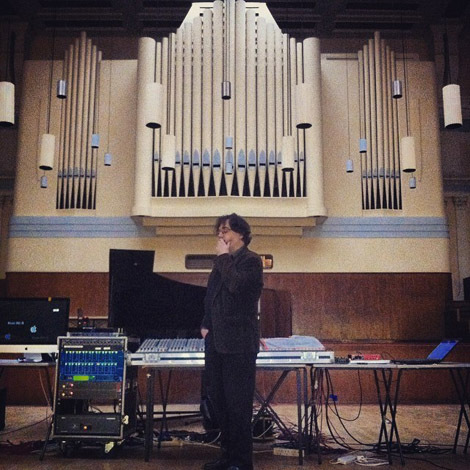 Thanks a lot to Tom Mudd and everyone else who made Sounding The Great Hall last weekend such a great time. Apart from hearing everyone else’s stuff, it was great fun playing around with eight loudspeakers in such a loud, cavernous room. As it happened, James Wilkie got a photo of me contemplating where to pan the sound next. It was interesting/disturbing to hear how much the music changed in the space – you really don’t notice how much reverberation is in a room until you realise it’s swallowing up all the detail in your piece. It was a pity I didn’t have the right technical equipment with me to do a real separation of different signals to manipulate directly to each of the eight channels, but it’s got me thinking about a next time. For the people who contacted me saying they couldn’t make it, I’ve uploaded a recording of my set. It was a performance of the piece Chain Of Ponds, which I’ve discussed before. All sounds were generated in real time by digital feedback synthesis, controlled by chance-determined scripts running on the computer. The recording is a direct line feed from the computer itself, with just a little bit of the room ambience mixed in. The link below should stream or download – your choice. As a bonus, I’ve uploaded another recording made at home tonight. This is the same setup as used at Goldsmiths, but with different bias weightings plugged into the controller script. It shows how the piece can be recognisably similar while still producing very different sounds and overall mood. I promised to post a sample of what to expect at next Saturday’s gig in the Great Hall at Goldsmiths College, so here it is. Chain Of Ponds is a composed system of interconnected digital feedback circuits. 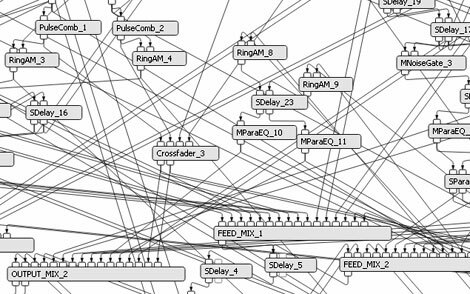 All the sounds are generated in the software programme AudioMulch, configured into a complex network of components. None of the components generate an audio signal or play samples; the sounds are produced by the interaction between the components. I’ve written a script in Cakewalk Application Language which generates a chance-determined MIDI file to control the AudioMulch file. Over 800 parameters are individually controlled and adjusted by this MIDI file. The weightings of the chance operation in the script can be manipulated by the user, to influence the probabilities affecting attributes such as density of events, types of activity, the range of possible changes, lengths of periods of stability/instability, subdivisions within the work and to “silence” or “freeze” certain parameters, each assignable to different groups of controls. In the Great Hall I’ll be diffusing the sounds generated in real time, controlling the sounds sent to each of the eight speakers located around the room.